In excellent condition, includes stand and original packaging. Originally purchased from Iron Studios directly, displayed in glass cabinet in smoke free environment. Release date is subject to change. The current release date is what is given to us by Kotobukiya. We stand behind our products! 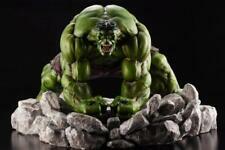 This is a Incredible Hulk 15" Painted Statue. Manufactured by Marvel and Sculpted By Randy Bowen. In Great Shape. I opened the box for pictures only. This item has not been displayed. More statues and comics will be listed over the next few weeks so keep an eye out. Type: Statue. TheHulk Statue specially features Manufacturer: Iron Studios. What's in the Box?. Height: 10" (254 mm) | Width: 8" (203.2 mm) |. Based on original 3D references from the movie. Product Size. MAR V EL - HARD HERO - THE INCREDIBLE HULK COLD CAST PORCELAIN STATUE ! Product was opened for inspection and looks great. This is an artist proof with no emblem/label under base. The art box has dents and creases and would say is in sub-standard condition. Marvel Incredible Hulk Mini Statue Randy Bowen Gray Version # 673/4000 AVENGERS . Condition is New. Shipped with USPS First Class Package. Condition is New. Its becoming an all too familiar situation. Release dates are set by manufacturer and can be subject to change. BUT its usually what they say it is during that month. I stay communicating and open with them. Hulk Statue, Lot of Marvel and WWE Figures, XBOX One Ferrari Steering Wheel. Condition is Used. Shipped with USPS Priority Mail. Material: PVC. Version: Made in China. Material: PVC. Uses:toys, decorations, collectibles, gifts. Color: As picture show. The statue stands nearly 10" tall. This is a Bowen Designs Incredible Hulk savage version statue. The box has minor storage wear. XM Studios is excited to present our next Marvel Premium Collectibles series statue, The Incredible Hulk! A word of caution, keep your other statues away from this raging beast! HULK SMASH! Pics are of actual item. Great size and fits well with other 1/3 or 1/4 scale statues as HULK is huge. Now need to make room for other statues I want to display and don't have room. Material: PVC. Due to the difference between different computer monitors, the picture may not reflect the actual color of the item. Size: 36CM/14". Gladiator Hulk PVC Diorama Statue 12-Inch Thor Ragnarok Figure Marvel Gallery Condition is New. Shipped with USPS Retail Ground.